Improve your emotional state & enhance spiritual awareness with essential oils. Essential Oils do a lot more than just smell good. They stimulate olfactory receptors and activate regions in the brain’s limbic system associated with memory, emotion, and state of mind. The limbic system gathers information from our environment through sensory information. This is why certain smells conjure up memories and even physical feelings very vividly. Our sense of smell is quite different than our other senses (such as taste, sight and hearing) because it bypasses parts of the brain that the other senses often cannot. Because of this, smells can bring us back to past events within seconds. As someone who has overcome fibromyalgia and chronic fatigue, I know how damaging toxic products and a toxic diet can be to your health and to your wellbeing. My passion is to help others find naturals ways to heal more deeply and find harmony within. I share simple tools that that actually work and that will facilitate real healing and transformation. I know first hand how frustrating it is to stick to a healthy lifestyle and get results with diet changes, natural supplements and other tools. It can be overwhelming with all of the choices we have. At one point, I tried just about anything I could to find pain relief, inner peace, and happiness. Ultimately, a combination of a healthy diet, Reiki, crystal healing and regular use of high quality essential oils is what accelerated my healing and brought more happiness and inner peace into my life. It’s true! You can enhance your health, happiness, and inner peace with full support so that you actually get results. Essential oils and essential oil based supplements are natural, non-toxic, and simple to use. Essential oils are safe and effective and support wellbeing on many levels. Not sure which ones to get? Young Living has an AMAZING starter kit to give you a highly affordable (and time efficient) way to jumpstart your natural health journey, plus provide a way for you to earn and get essential oils at a significant discount. Using essential oils is one of my favorite forms of self-love, self-care, and self-healing! Now I’m thrilled to share this essential oils starter kit with you. This is exactly how I got started (and hooked on) using Young Living oils. They were a game changer for me! Learning how to use essential oils to improve your health, wellbeing and spiritual growth is easy! When you become a member, you will get my support and guidance with how to use the oils to enhance your life, including tips for how to make your oils last a very long time by diluting them with carrier oil and making roll-on oils and sprays. I will also give you all of my favorite combinations and show you how to make roll-ons and sprays infused with positive intentions for healing. You can use these for yourself and also make them for friends and family, give as gifts or sell them to your clients! Once you have a high quality oil that is highly concentrated and very potent, you will see how far one little bottle can go! 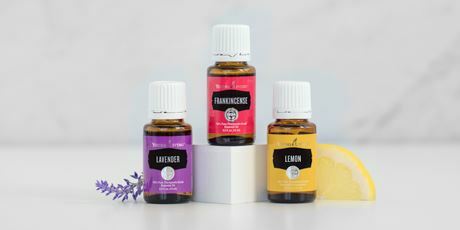 12 5ml bottles of our exclusive essential oil blends and single oils: Lavender, Lemon Vitality, Peppermint Vitality, Frankincense, Thieves Vitality, PanAway, Raven, Citrus Fresh, DiGize Vitality, Peace and Calming, and Valor. 6. Select your Premium Starter Kit. This is where you can specify which starter kit you would like (and you know I think the Premium Kit is the way to go!). You also get to pick which diffuser you would like with your kit. (I personally love the Desert Mist or Dewdrop diffuser). Sign up with one of these kits to become a Wholesale Member. You can also purchase other items at this time if you wish. Young Living does not have any contracts, monthly minimum purchases, or annual fees. Nothing like that. It truly is risk free to add these amazing oils to your life. 9. CONFIRM YOUR ORDER. Don’t miss this step or you will end up not fully checking out. Becoming a wholesale member does NOT mean that you are obligated to distribute the oils. It simply means that you get to enjoy the benefits of a discounted wholesale membership and save 24% on everything you order. Young Living is risk free, meaning you do not have any monthly minimum purchase requirements, contracts, or annual fees. They let the products speak for themselves. And trust me, the oils do speak for themselves! I’ve used dozens of different brands over the years to make essential oil sprays and oils for personal use, with clients, and for my energy healing room. I can honestly say that YL oils are high quality and highly effective! You will understand when you begin using them regularly. One of the most important things I’ve learned in my journey to healthy living is that it’s not just what something is – it’s where it comes from, how it’s grown, and how it’s processed. Just like I want to know where my food is coming from, I also want to know where my oils are coming from and what’s in them. I did many hours of research to find an essential oil company that I felt I could trust with my health. Young Living is that company. They have been around for more than 20 years and the only essential oil company that owns farms all over the world (including France, Oman, Ecuador, and here in the U.S.) and oil distilleries. The best part is, once you order your premium starter kit, you are free to just order more oils as the need arises… or not. You are never required to order anything, ever. However, as a wholesale member you will always pay 24% less than retail on everything you order. And, you are not required to sell anything. To become a Wholesale Member, you simply start by purchasing the Premium Starter Kit. This is the same kit I purchased when I got started with Young Living oils. It is the most cost effective way to get the most oils at once. Not to mention you will also get the home diffuser (PS- did I mention that my favorite is the Desert Mist? The light on the diffuser changes 7 different colors that happen to align with the 7 Chakras). PLUS- If you sign up today I'll gift you with a goodie bag to help you get started with essential oils. I will personally send you a gift bag with some additional tools to use with your oils, including a glass roller ball (to make your own oil blend), and a 4 oz spray bottle (to make a room or pillow mist). I am also giving you a free book that explains where to place oils from your starter kit on your body, how to use oils for emotional support, plus 10 ways to use the oils in your everyday life. You will have everything you need to confidently use your oils right away to support your health & wellness needs and live a non-toxic lifestyle. (This is not from Young Living - it's from me!) + You will become part of our amazing oil team and have access to private groups with some pretty amazing resources! Use this form to ask me any questions you might have about getting started.